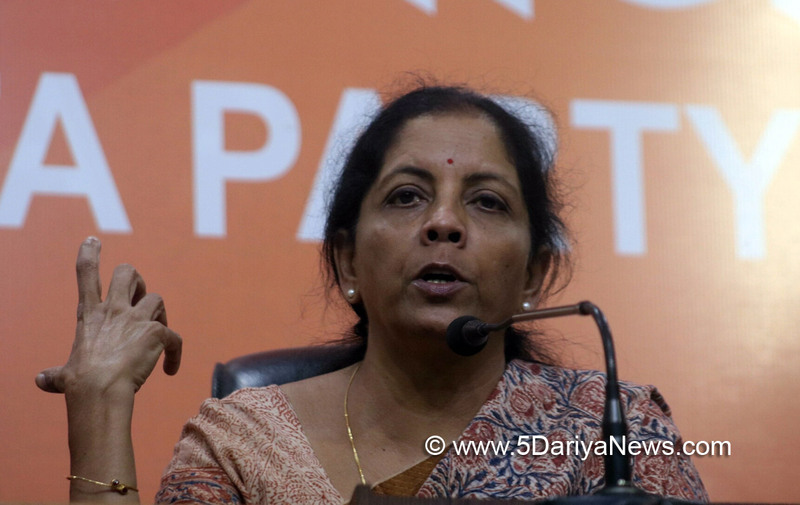 Defence Minister Nirmala Sitharaman on Monday said militants who killed five soldiers and a civilian at an Army camp in Jammu were Pakistanis and warned that Islamabad will pay a price for the terror attack. "Pakistan will have to pay for this misadventure," Sitharaman told reporters here. The deaths of "our soldiers won't go in vain".The minister was in Jammu to take stock of the situation at the Sunjuwan Army camp which three heavily armed militants stormed on Saturday morning and entered the residential quarters of junior commissioned officers, spraying bullets and hurling bombs.The operation was called off on Monday morning after the three attackers were killed. A fourth one, she said, may have been a guide and didn't enter the military base. "Since the terrorist were dressed in battle fatigues and had similar appearance to their possible target victims, the operation had to be done (in a way) to eliminate the possibility of any mistaken identity of collateral damage. "She said the operations entailed a search of 26 blocks and safe evacuation of families from 189 residential flats. Sitharaman said the three militants were all Pakistanis and were handled by their Jaish-e-Muhammad leaders across the border. "The terrorists belonged to JeM, sponsored by Masood Azhar residing in Pakistan and deriving support from therein," she said, adding a possibility of local support was being investigated. "The cantonment is located on the outskirts of Jammu, approximately 30 km from the International Boundary, in a semi-urban environment with densely populated civilian localities adjacent to the cantonment perimeter wall. The demography of the cantonment and the adjoining area indicates the possibility of local support to the terrorists. "She said the Jaish module that conducted the attack may have infiltrated sometime back. "Our intelligence inputs indicate that these terrorists were being controlled by handlers from across the border. The evidence has been scrutinised by National Investigation Agency who shall soon furnish a detailed report. "The Minister asserted that evidences related to Jaish's involvement in the terror attack would be shared with Pakistan. "Giving evidence to Pakistan is a continuous process. It will have to be proved over and over again that they are responsible." She said giving evidence to Pakistan would not prevent the Indian Army from responding "appropriately and at a time we deem fit".The Minister said infiltration from across the Line of Control had ebbed to a great extent due to "anti-infiltration obstacle system and a dynamic multi-layered counter-infiltration grid" and activities of militants in hinterland were also being curbed.Despite this, she said, "Pakistan is expanding the arc of terror and resorting to ceasefire violations to aid infiltration. "Although the terrain configuration and snow conditions make it difficult to complete or stop the infiltration, the government is taking a host of measures in procuring modern electronic surveillance systems to implement Philip Campose committee report which was instituted to review the security of all military installations for which a sum of Rs 1,487 crore has been allocated. "She said other measures to stop infiltration of militants and enhance alertness along the border included installing additional censors, UAVs and long range surveillance devices "to cover the entire frontage of the LoC".Earlier, the Minister undertook an aerial survey of the Army station and visited the Army Hospital in Jammu city where those injured in the terror attack were being treated.She also called on Chief Minister Mehbooba Mufti.